Fluke 170-series rotary switch knobs can be removed for cleaning and/or lubrication. The area under the knob can collect dirt and gunk, which will lead to rough operation and possibly even damage to the end stops. 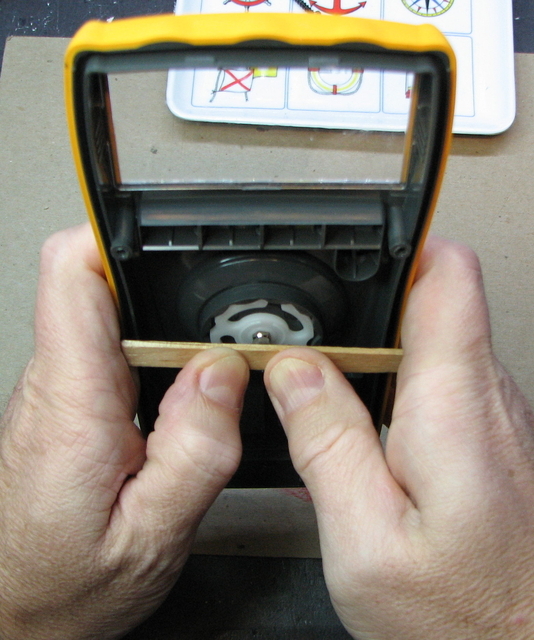 But it may not be immediately obvious how to go about getting it apart without damaging something. Follow these steps for easy disassembly. The knob has a hex-shaped metal shaft permanently attached. The shaft is simply press-fitted into a white-colored detent spring on the underside of the cover. Pressure on the shaft is all that is needed to release the assembly. Grasp the cover as pictured. Use something like the popsicle stick shown to transfer the force from your thumbs evenly to the shaft, and provide a safe place for your thumbs to land when it pops. Keep your fingers clear of the knob, it has to be free to come out. Push HARD and the knob will pop out about half-way. Grasp the knob and finish pulling it apart, or you can push the metal shaft the rest of the way with a screwdriver from the bottom side. Clean the knob and the knob well of any dirt or crud. Note that there is an O-ring around the knob shaft, and take care not to lose it. A tiny amount of silicone grease or petroleum jelly in the groove where the end stops run will lubricate and help provide smooth operation. The center hub of the detent spring and the scalloped ring that makes it ‘click’ also benefits from lubrication. Note that grease can attract dirt, so if the multimeter is to be used in a really dirty environment, it may be better to skip lubrication. To reassemble, insert the knob back into the cover and press the detent spring firmly back onto the metal shaft. 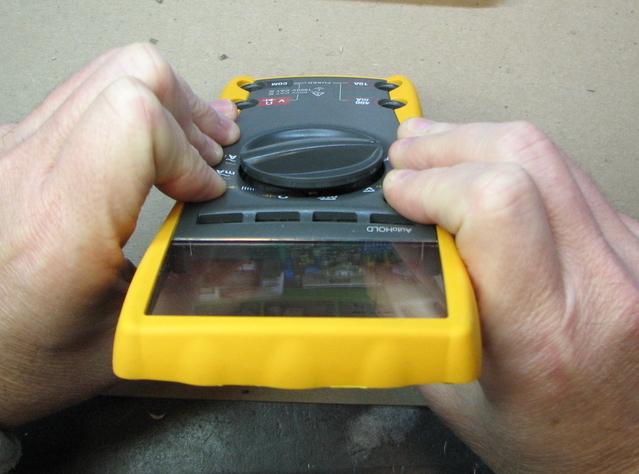 This entry was posted in How-To and tagged 170-series, DMM, Fluke. Bookmark the permalink. above diagram is broken, how can i get hold of this part? How or where can i purchase these spare parts from .My 175 true rms body & lcd got damaged. Really appreciate some help please. 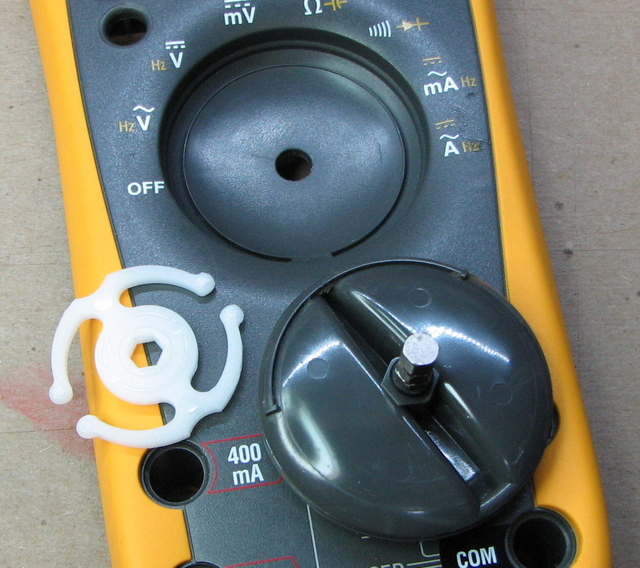 The Fluke part number for a 175 case (top) is 1591675. The LCD part number is 1560856. You can try ordering these from Fluke service. If no luck there, the best bet is a parts donor unit from eBay, pawn shop, etc. Thank you. This also works to the 87V series. How do you remove / re-install the selector knob on a Fluke 373 clamp on meter? Sorry, I’m not familiar with that model.